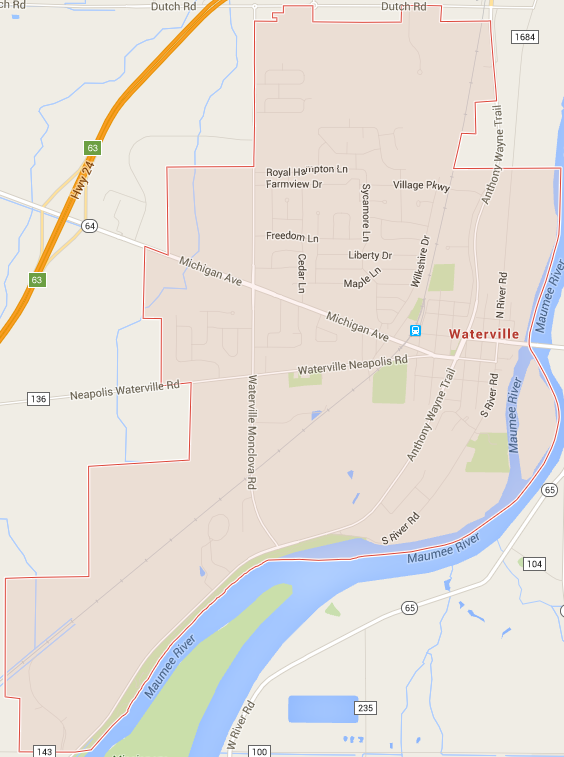 Incorporated in 1882, the village of Waterville, Ohio is located on the Maumee River some 12 miles west of Toledo. The village’s 5,000 residents enjoy the quaint historic downtown restaurants and shops as well as six parks in the area. One tourist attraction in the village is the Columbian House, built in 1828. During its existence, the building has served as a trading post, tavern, inn and restaurant. Waterville was also home to some of the first canal boats in Ohio, dating back to 1843. Part of the Anthony Wayne School District, Waterville’s students consistently score high in the state’s proficiency tests and the district is rated as “excellent,” the highest rating in the State of Ohio. There are three elementary schools that house grades K thru 4, one middle school for grades 5 and 6, one junior high for grades 7 and 8 and one high school. One of the fastest growing suburbs of Toledo, Waterville hosts several annual activities including the Roche de Boeuf Festival each September. This arts and crafts festival draws thousands to the two-day event. The City of Waterville is part of the Anthony Wayne School District. The Anthony Wayne School District is comprised of students from Waterville, Whitehouse, Monclova, and their respective townships. Anthony Wayne Schools are unique in the way its campus is set-up. Monclova, Waterville, and Whitehouse each have an elementary school. Students from all three elementary schools come together at Fallen Timbers Middle School. The middle school, junior high, and high schools are located on the same campus on Finzel Road in Whitehouse, Ohio. This special campus set-up allows for convenient transportation as well as easy accessibility to athletic practices and events. Anthony Wayne is proud of its academic integrity. Students score substantially higher than both the state and national averages on standardized testing. Many students receive academic scholarships to support their college educations. Anthony Wayne also gives students the option of attending Penta County Vocational High School. Penta County offers juniors and seniors a chance to explore over 30 trades, giving them a head start on their careers. Private and parochial schools for various grades are also available in the area. Advanced and continuing education is available in the area at the following institutions: University of Toledo, Bowling Green State University, Defiance College, University of Findlay, Heidelberg University, Tiffin University, Adrian College, Owens Community College, and Lourdes College. As well as being located along the beautiful Maumee River, Waterville has the pleasure to be home to some very people friendly parks. We are also fortunate to be located close to several of the Toledo Area Metroparks.There are parks for all ages and activities. So whether you enjoy sitting by the river reading a good book, enjoying a variety of playground equipment, walking a trail and checking out the area wildlife or having a picnic with the family there is a park here for you. Please feel free to browse through our local parks, then plan a visit to see how beautiful they are in person.